A new Ministerial Advisory Committee will work with community and Traditional Owners to protect waterways in Melbourne’s west. 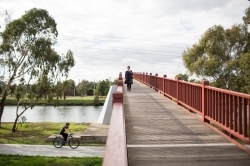 The Rivers of the West project focuses on reforming policy and governance of the major waterways in Melbourne’s west – the Maribyrnong and Werribee rivers – with a view to protecting and restoring biodiversity in these river corridors in the long term. These rivers are key environmental and amenity assets for communities in the metropolitan and hinterland areas, but are also degraded as a consequence of historic and current human impacts and pressures. recommends ways to maintain and enhance community ownership of the river corridors. The action plan will build on Victoria’s current water policy Water for Victoria, that recognises the connection that communities and Traditional Owners have to waterways and their landscapes. Community catchment-based workshops, similar to those held in the lead up to the Yarra Act, are taking place over November and December and the project’s reference group have been on site tours around Jacksons Creek, Deep Creek and the Lower Maribyrnong. For more information visit the Melbourne Water and CRCWSC websites, or email westernrivers.inbox@delwp.vic.gov.au.